Put all ingredients except cacao and nut butter into a shallow bowl. Soak in just enough hot water to cover ingredients. When dried fruit is soft (or next day) blend all ingredients together until smooth or to desired consistency. If you have a sweet tooth, feel free to add in a little maple syrup here. Roll into small balls and place on tray lined with baking paper. Put in freezer and eat whenever you like! 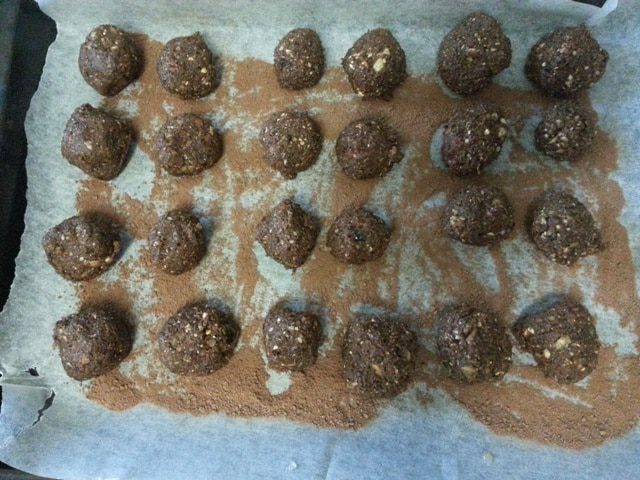 Balls can be rolled in coconut, chia seeds or even oats to change things up.